Later topic: What are these? I bought a proof press 2 months ago, and I never found anything about this kind of press. So any information about this old beauty would be helpful ! 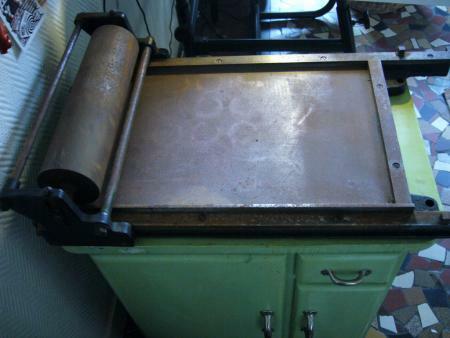 This is a gallery tray proof press. The type form is on the galley (http://museumvictoria.com.au/collections/itemimages/250/628/250628_large...) and the type is hand inked and a sheet of proof paper is placed over the type form. The roller is pulled acrodd the type and while the rollers pass over the sheet the sheet is removed and the galley is also removed from the press. The roller now can be returned to it starting point. This is press is for proofing only and has no control of placement of image etc. This was a press used everyday is letterpress shops to proof their work before placing on or in a press. Thank you… I know this is a proof press, but I tried to find more informations about this one especially… I found nothing ! Anyway, thanks a lot ! One of these is up for sale on New Zealand Trademe (our equivalent of eBay). I assume it is a basic proofing press and there is no way to turn the impression off or raise the impression cylinder so it can return to its starting position without touching the type in the bed. I would be interested in knowing if the impression can be turned off in some way (without removing the type from the bed!). A Google search resulted in a single mention of G.E. Reinhardt in the October 1923 edition of the Inland Printer (https://books.google.com/books?id=nxUhAQAAMAAJ&printsec=frontcover#v=one...). 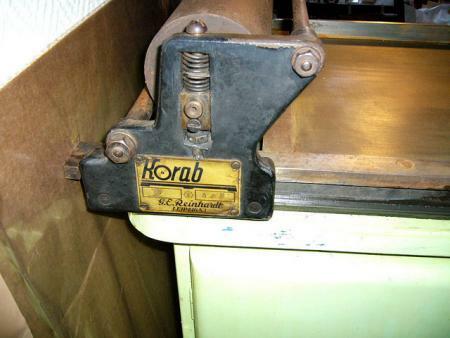 According to one of the blurbs, at that time they had been around for more than 40 years, and were advertising themselves as a source of, “Printers’ Sundries in Metal.” Maybe you can find more about them, and in-turn, more about your press. FYI - You can probably build a tympan & frisket setup for that press to give you multi-color registration capabilities. And if you didn’t want to always use a galley tray when printing with it, you can add a sheet of metal of the same thickness as a galley tray to the press bed, and just leave it there. For galley presses that don’t have a trip option, it’s common practice to place a sheet of scrap paper over the form on the return stroke so the impression roller doesn’t get ink on it. If there’s another reason for raising the cylinder, this press’s cylinder is spring-loaded so if thee is enough latitude there, wide bearers that are over type-high might lift the cylinder. Lewis Allen’s handpress book suggested removable inking bearers that are u-channel stock that nests over features in the form; you could have something like that that is higher but would be removed for the print stroke. Try using an offset press blanket or a sheet of rubber gasket material that can be purchased at a hardware store. You can get a used blanket from a print shop. - Lock-up the form without a galley tray. The impression roller will not touch the form. - Ink the form and put the paper in place. Put the frisket (rubber blanket) on top of the paper and pull the impression. - Now remove the frisket and paper and return the impression roller to the start position. An added benefit is the rubber blanket will forgive imperfections in the impression roller. Because the handle bar on the impression roller unit is not symmetrical looking at the assembly from a side, it is clearly designed to be pulled in one direction. So, it would seem it would only print in that direction, that is when your hands are pulling on the handle bar. Therefore, there must be some mechanism or lever to put the roller in the off or no impression position but I cannot see it in the pictures posted here or with the item on our Trademe site. Unfortunately, the original poster is not a regular attendee and he/she has not responded to my direct email to him/her.